Truffle wanted to buy even more boxes, but the car was already crammed with dog show equipment. so we squeezed the box of violas by my feet, and put the pansies on my lap. Good thing I was the passenger and not the driver... ...Lol. Get planting Truffle. Have you put those Wallflowers in the borders yet???? sometimes Truffle manages to help without eating the watering can..Lol. Truffle you are a star! Have you been helping Mum dig the holes for the pansies too...? Truffle couldn't decide which violas to eat first..Lol. He now knows which way up the watering can should be. Lol. ~ what a star Truffle is~I can see he will be a good gardeners assistant! Growing quickly isnt he ..and so will those plants with such good maintenance .Did Truffle drive you home too ? Hes one smart fella.. Truffle isn't old enough to take his driving test yet, but I don't think he'll have "L" plates for long...Lol. NO VIOLAS WERE HARMED DURING THE TAKING OF THIS PHOTO...lol. awwww.... Truffle is looking so great.... grown up! Hywel ~ Truffle is keeping Dora watered too. Lol. Now I not only have Conker working for me on the mowing, but I can find a job for Truffle doing the watering, he certainly looks keen. Retirement here I come Lol. Ahrr how sweet and a good Idea too. ... whether choosing or chewing..Lol.. WOW!!! That was a very fast reply! I'd hardly got back to my homepage when I saw your reply! It's great to see how your dogs work with you. I had my kids & now my granddaughter to help me with the watering! It took me longer to answer your comment on my Rainwater Cuttings blog... only just done that...Lol. Truffle says he's pleased you approve of his viola selection..Lol. He's not chewing, Terra - he's pruning, making room for his pansies. Truffle prunes biscuits in exactly the same way..Lol. Oh I can just picture that, lol. Well didnt you do well Truffle, you certainly know how to find a Bargain, no wonder you look so pleased with yourself! Hello Truffle!! What a cutie youn are and looking after Mums plants too....he is beautiful TT! Lovely dog! What a great name too for a dog. I have a dog called Timmy, he's a Jack Russell cross with a lakeland terrier. Jack Russell/Lakeland cross sounds a super mix.... have you paintings or photographs of Timmy? Truffle is growing into a hadsome lad. He obviously is learning his gardening skills from Conker. The plants look wonderful for £2 a tray. The conkers are dropping here and I know a young lad down the road who loves me to collect conkers for him!!! Well done Truffle you will make a great assistant gardener for Conker !! While waiting in the vet clinic car park yesterday, walnuts kept falling on our heads from a huge tree...Lol. Not only handsome and clever, but Truffle also has an eye for a bargain! Bargain prices for plants means there's more money to spend on dog biscuits..Lol. Like the name Truffle, lol. I like the name Heron...Lol. Conker the Sheltie, Truffle the Smooth Fox Terrier, and Crocus the budgie..
Truffles knows a bargain when he sees one then...can he come shopping with me?! Truffle can show you where to buy the best plants..... and doggie rope toys... and the best doggie biscuits.... and best sounding squeaky toys... :o) Lol. Oh bless him...bet your watering can is full of toothmarks too!! How much can he carry? I need a porter when I buy cheese these days! Can't get to the dairy section again Marie without grabbing a clematis?!! Truffle will eat the cheese, to save your having to carry it home..
... and, Fluff, he's very good at grabbing ceanothus branches... gets lots of practice in the dog run. Lol. I'm having to avoid dairy til the wages start to trickle in again! Lol! LOL! I prefer chevre!! I'm a fussy student!! I love him with watering can! 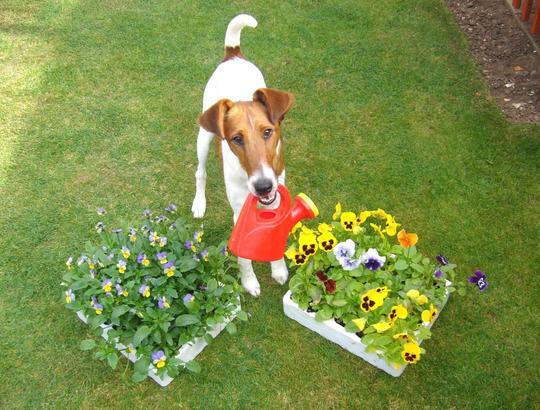 He bought a bargain there, please can he come around and help Todd and I find some winter flowering Pansies? ...picking up tips on watering, weeding, digging, ...Lol. He's holding a watering can full of rainwater, so please don't tip the parcel on its side.. Lol. a very helpful looking fellow! Hi Pitta! Welcome to GoY! Hi Terra! How are the boys today? Havent checked Conkers blog yet! Just in from work! Sweet dreams! I just read it! Fantastic news!! Sorry I haven't checked your news on Conker either. This last week I've spent a lot of time on updating my webpages & so I haven't been on here much. LOL! He'll never slow down, that one! Good to hear that Truffles is still running around at top speed! My broadband speed seems to be back to normal today! I can't understand what happened yesterday. Everything took hours to upload or download - I couldn't make a blog on the council gardeners I had intended doing again. Tonight I can read all my news & write replies as well & I'll still have time to read our people's blogs & catch up on what I've missed lately!